The important things that count in life: Still the way I see it is that the Devil is alive and well in some churches too.. Still the way I see it is that the Devil is alive and well in some churches too..
(Prov 9:8 KJV) Reprove not a scorner, lest he hate thee: rebuke a wise man, and he will love thee. (Prov 13:1 KJV) A wise son heareth his father’s instruction: but a scorner heareth not rebuke. Now a Baptist pastor had cheated, for he had short circuited the elders, deacons church selection process, he had the nominating committee first, before any selection submit the names to him for his prior approval of their supposedly spiritual qualifications and he thus by these means had elected his bad friends.. one Sunday evening as I was leaving the church and shaking hands with the pastor, he unexpectedly said to me “ this is my church and if you do not like it get out”.. shocked and surprised I said to the pastor if I have offended you let me meet you now this week Tuesday night and you can bring any two witnesses you want as well and we can discuss the matter. So he agreed and I knew that he would bring the head elder and the head deacons.. as I walked into the pastor’s office on Tuesday day night, the founding church pastor said immediately to me wipe the smirk of your face.. so I immediately said.. hey pastor let us also now make this quick, “Did you or did you not say to me this is my church and if you do not like it get out?” And you should have seen the shock on the deacon and elder’s faces. The pastor seeing this too next said you cannot hear any charges from this man for I am a senior and if you listen to him I will resign. I said “Pastor if you want to resign, do so, but cut of the emotional black main and answer the question”.. he resigned instead, and became a life insurance salesman rather next.. But now I still had a problem with the crooked head elder so I tried to first talk to him about his immoral acts and lack of spirituality, he admitted to me that he had no time to read the Bible even.. but it was useless to talk to him for he laughed me off. So next the elder came to see me and said “you know when you told everyone about my lack of spirituality it did not bother me, it was your word against mine, but when you next had put it in writing to all to see it hurt”.. and I said back to him.. “is that what it takes to cause you to rightfully repent?” seems people tend to believe the truth only if it is in wring these days.. and ever since that day I have also next been posting unacceptable, unrepented of sins of many, many a bad pastors and elder on the net but few of them next repented, less than 5 percent next, some of them even moved rather out of town instead.. and many were rightfully fired next. Not surprisingly many prideful people try to take the place of God in my life too, AND these imposters claim even that they have been chosen, designated by God to command over me, THAT I am required into forced submission to their whims, desires , commands and teachings. But funny God now himself has not revealed those facts as well to me BUT only to them. I put my trust in God and not in mere man.. So your useless opinions of me do not even pay my Salary, God alone does that.. .You a control and all who would falsely try to dominate, control me, all claiming that God has appointed them to these roles.. they all can dream on. We all are to submit ourselves solely to God, to Jesus and the Holy Spirit.. who guides us, leads us into all truth. 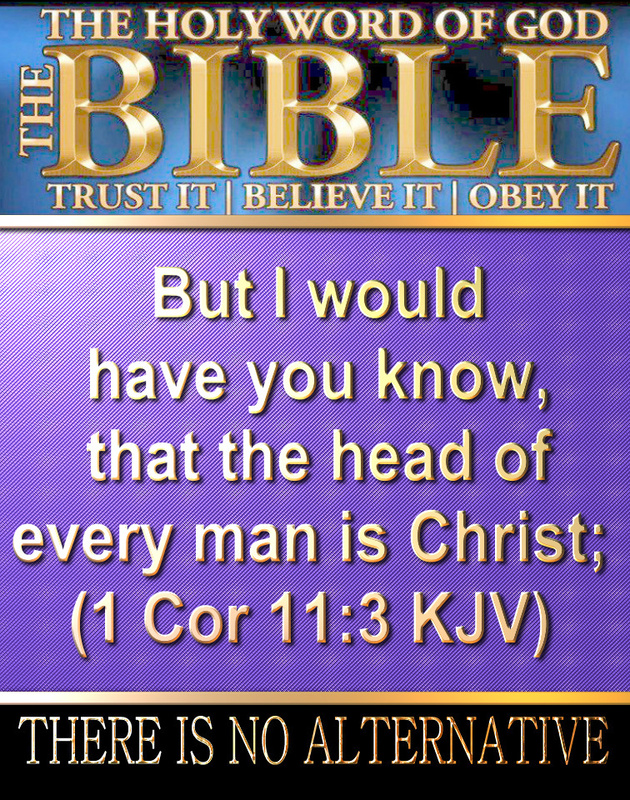 Jesus Christ is still the head of the Church, Churches! 1 Pe 1:5 who by God’s power are protected through faith for a salvation ready to be revealed in the last time. Now you are even cursed if you are under any human covering but God.. There are any number of untold horrors that lurk for those who step outside God’s covering.. It is Jesus Christ that protects us. We are protected by the Holy Spirit through faith. There is no mention anywhere in scripture that submission to authority is required for spiritual protection. Demand for coverings are a spiritualized protection racket, an extortion scheme where some offer in return you their spiritual “protection” services. Any submission is reciprocal, mutual, based on one’s free will still. Dictatorships anywhere are all still demonic. God’s chosen leaders still cannot force any one into submission, for all submission is even mutual, voluntarily, willingly, unenforceable and all leaders are to be exemplary now firstly too and not rather HERE mere commanders or dictators I know that this forced submission emphasis, demands are a false attempts by these overly perverse, ambitious, crooked persons, bad pastors and bad religious persons now included too, for these persons and mere persons who do want now by such means to attempt to self prosper, to grow richer, to advance themselves over others still have no good concerns for me. They are slave drivers. Slavery was abolished a long time ago too. Let me be very clear about that I am a slave to no man but to Jesus Christ himself, alone. I serve no man, especially any of the clearly foolish, perverted ones, and I take orders from no man, I do not have to do what they desire or try to command me to do at any time too. No matter if they still do wrongfully think otherwise too. I am still only God’s slave and not any man’s. God’s ideal of a real Church now would be where everybody was just one big happy family of brothers and sisters behaving in love , decency, honesty too… but even many homes, families do not have this and why? The devil, sin and self centeredness, false pride run the homes and many churches, church pastors now too. Prideful, ambitious, control freak, pompous Satan and his earthly followers do hate the way God has redeemed us from the curse of the Law (Gal. 3:13; 5:18 ) and hate us being freed, free in Jesus Christ, our blood-bought freedom too. Satan is really delighted now to see all the enslavements, abuse , chicanery and robbery going on in his rather den of thieves masquerading as a true church or a house of God! When you’re about to be thrown out onto the street for lack of rent money, you just try to get one of those tithe-collecting tycoons to share with you the way the first century Christians did with those in need. Yeah, right, he’ll “PRAY” for you, that is, if you can get past his entourage of ushers. All of the Loyalty should be to Jesus Christ alone, the Word of God! There is no hierarchy in the body of Christ, where every one has their own function, the apostles, prophets, pastor have a function, even the deacon has a function, the elders as a whole has a function. One member in the body of Christ is not more important than another. They all have a function. Romans 12:3-6 says, “ For as we have many members in one body, but all the members do not have the same function, so we, being many, are one body in Christ, and individually members of one another. Having then gifts differing according to grace that is given to us. Sadly the role of pastors and deacons in the churches today does not match the role of deacons set forth in the book of acts. 1John 4: BELOVED, believe not every spirit, but try the spirits whether they are of God: because many false prophets are gone out into the world. Colossians 2:8 “Beware lest anyone cheat you through philosophy and empty deceit, according to the tradition of men, according to the basic principles of the world, and not according to Christ. 2 Timothy 4:3,4 “ For the time will come when they will not endure sound doctrine, but according to their own desires, because they have itching ears, they will heap up for themselves teachers; and they will turn their ears away from the truth, and be turned aside to fables. SATAN Wants You even today. The same very busy devil who haunts the Las Vegas casinos, Church Bingo Halls, Lottos, who often even in churches wears a nice suit and tie to look respectable enough to con you out of your money, with half truths too, and with the false promises of earthly wealth in exchange for “your sacrificial gift.” Wonder how he got his suit too? He wants also you, he wants to net you, to fleece you, and for you be diverted, to miss the boat, he does not want you on the straight, narrow path that next also leads to Heaven, rather he wants you on the broad path that leads to hell. He clearly does not want you to live by faith in God to look after you, rather he wants you to do your own thing, for you to look after yourself. Don’t trust God he says, trust in others, trust in the Apostate Church, and in the crooked preachers too, or trust yourself rather. Trust even the too often bad Preacher these days who first Wants His Cut. He the preacher now also does wants to know What’s in it for him? Preachers seem these days to be always hollering about how everyone must submit to THEM, it is a one way enforced submission and not rather rightfully a voluntarily , reciprocal mutual one, and pay up, pay the tithe , or they’ll roost in Hell for all eternity. The same too often false PREACHERS who refuse to submit to others and to the whole Word of God especially. Telling the truth and sharing ALL the counsel of God as the Apostle Paul did (Acts 20:27) can be very costly with the preachers losing not only control of the money but CONTROL over people’s lives, and the false gratification it brings to their too often already swelled egos too. Satan likes to have the church members stranded in the Old Testament paying of the of tithe that next will be too often abused by the too often bad pastors now as well..
God took the initiative to have a great church by imparting His good Holy spirit gifts to all, these mostly Gentile converts now too. But some how along the way these gifts and the related gifted men and women they have next too often been neglected, abused, distorted.. and many people these days in the churches even need to be he rescued them from these kidnappers. Preachers too often also falsely say do what I say and not what I do.. especially not the bad things. Go to the preacher for help and think you really are going to get it next? Often not now too unless you FIRST give money, your full “tithe” to Him? the preacher’s palm firstly still does even needs to be greased with a lot of money? But don’t even expect the help to be real, valid next too. I myself always prefer to go to God alone rightfully still and not any preacher. If your are laid off, sick, unemployed, poor and there just ain’t much money to be gained from you don’t expect to be welcome back to most churches these days, I mean social /Cultural/pride clubs, not really Churches. Prideful, ambitious, control freak, pompous Satan and his earthly followers do hate the way God has redeemed us from the curse of the Law (Gal. 3:13; 5:18 ) and hate us being freed, free in Jesus Christ, our blood-bought freedom too. Satan is really delighted now to see all the enslavements, abuse , chicanery and robbery going on in his rather den of thieves masquerading as a true church or a house of God! The devil and the too often bad pastor claim they knows what’s best for the flock so they’d better not take their freedom in Christ too seriously. Satan laughs at the sheep being able to hear the Voice of the Good Shepherd for themselves (John 10:27) he would rather would rather have them listen to some amusing preacher who perversely usurps the place of God the Father in their lives. These leeches also lay heavy burdens on God’s sheep , heavy burdens God never authorized! Satan and his bad preachers continues to rob God’s people of their identity, self worth, of BEING sons of God, made free in Christ, part of the House of God. “Instead, that honor is bestowed on some multi-million-dollar cathedral funded by TITHES AND OFFERINGS (freewill offerings are fine when necessary to meet REAL needs like feeding the poor and for missions, etc). Satan would far rather get Christians obsessed with remodeling the “sanctuary” (an Old Testament term) to the point where they neglect the care of poor Christians (God’s TRUE house). ” When you’re about to be thrown out onto the street for lack of rent money, you just try to get one of those tithe-collecting tycoons to share with you the way the first century Christians did with those in need. Yeah, right, he’ll “PRAY” for you, that is, if you can get past his entourage of ushers. ” Who likely first will say your are poor cause you alone are at fault, are in sin or the lying, bad preacher will say you did not give the money to me, you gave it to God and God alone now, next is the one who will pay you, help you.. such hypocrisy too. Tithe givers and tithe Collectors live high on the hog while the poor “pew Christians” struggle to keep food on the table, a roof over their heads. (I Cor.12:5) Jesus clearly FORBADE the hierarchy (bottom-to-top pecking order) in His Body. He said in Matthew 23:8: But be not ye called Rabbi: for one is your Master, even Christ; and ALL YE ARE BRETHREN. Early Christians gained a reputation among non-believers for loving one another and being charitable toward the poor in their midst. But that is clearly now how it is these days, these days the privileged few “in ministry” fatten themselves at the expense of the struggling wage slaves out in the pews. Instead of being tenderly cared for by so-called shepherds, poor “pew Christians” get threatened that God’s gonna sick satan on them for failure to pay the preacher his cut before buying groceries and paying the rent. Satan now loves to see their kids go hungry while poor Christian parents pay tithes “by faith”, sacrificing the thin sliver of income left after rent, transportation and utilities are taken care of. God is NOT not at all pleased with any of such religious persons. For we are Christ’s Royal Priesthood (I Pet .2:5,9) and who are ALREADY seated with Christ in heavenly places (Eph.2:6) and these too often false preachers now would demote us from being freed, slaves of no man, and also from being Royal priests before the Lord. I have absolutely no doubt that many Canadian evangelical pastors included now are falsely lying, unacceptably misrepresenting the Biblical truth, pressurizing, twisting the arms of members and adherents to regularly tithe to their storehouse, to the Pastor’s benefit, so the pastor can live high on the hog now. Too often now the preacher still wrongfully tells the flock he’s their sole, responsible spiritual daddy and thus he always does knows what’s best for them, so now also they would better not take their full freedom in Christ too seriously and next try to do anything without consulting, obeying the preacher in all things too.. It is still not the preacher who is the head of the Church, Jesus Christ alone is, and it is still the Holy Spirit himself who will lead and guide you into all truth.. for the preacher job rather firstly is to lead us to God, Jesus, the Holy Spirit. Many Preachers do seem count on your ignorance of the Word of God as they often do also try convince you you’re way too dumb to argue with them, for God has spoken to them directly on the matter, and if you challenge them they tend to ignore you or kick you out..
(1 Cor 11:3 KJV) But I would have you know, that the head of every man is Christ; and the head of the woman is the man; and the head of Christ is God. Gal. 5:4: Christ is become of no effect unto you, whosoever of you are justified by the law; ye are fallen from grace. (Galatians 5:3). and instead of bringing a blessing, the tithing could make you fall from the grace of God, which would bond you to the application of the whole law and thus falling from grace means you cease to rely solely on Christ’s Sacrifice of Himself for your sins next to remain justified before a just and Holy God. You began your spiritual journey by faith and you also still do have to continue it by faith (Gal.3:3). Any religious act, regardless of how “holy” it seems, performed to earn or keep salvation, likley now next would be a one-way ticket to hell! Tithing thus also is the stumbling stone to the modern churches. Reliance on works of the Law is deadly, contrary to the saving faith in Christ! Gal.3:10: For as many as are of the works of the law are UNDER THE CURSE: for it is written, Cursed is every one that continueth not in ALL things which are written in the book of the law to do them (This includes such ordinances as circumcision, animal sacrifices, keeping the Sabbath, the Day of Atonement fast, letting your beard grow, covering every container in your house (Numbers 19:15)! Verse 11: But that no man is justified by the law in the sight of God, it is evident: for, The just shall live by faith. Verse 12: AND THE LAW IS NOT OF FAITH: but, The man that doeth them shall live in them. “Preachers are committing sin by adding Tithing on Wages, NOWHERE taught even under the Old Law! Preachers latch onto the ten per cent figure because it seems like a good idea, regardless of what God thinks. But they neglect the Israelites’ third-year tithe taken to feed the poor (Deut.14:28-29). Now South Calgary Community Church ( Baptist) nor the Calgary Christian Center ( Pentecostal), Calgary First Alliance Church, were not the only bad churches that I have now encountered,, it even took me a while to next figure out what was wrong with a close, personal friend of mine, an evangelical pastor, New Life Beginings Church (Pentecostal) and also with his associates now too in one of our local churches now too.. for he often had some of the right sounding words.. but some how I knew something was always obviously basically wrong.. it even was the fact he clearly was always now concerned about the Basics of life: food, clothing, shelter, job, image and too often rather.. their concern for having better material things… Mere Hirelings or prostitutes to me it means the same thing.. sadly the last 12 pastors I had personally encountered where now also hirelings!